For centuries, Christmas was celebrated not as a single day, but as a whole season in parts of the world, beginning with this day, December 24, Christmas Eve. Perhaps the practice of celebrating the evening before the big day is an echo from ancient Jewish reckoning. Among earlier Jews, a day began at six in the evening and ran until six the following evening. Had not Moses written: “An evening and a morning were the first day”? Christmas means “Christ-mass.” Although the date is a guess, the tradition of observing it goes back to at least the fourth century. Under the influence of the church, Christian traditions replaced pagan solstice festivals throughout Europe. Often the more innocent pagan practices (such as bringing in a Yule log, decorating with holly and the like) were carried over into the Christmas observance, transfigured with new meaning. There are many reasons to get a flu shot. The number one reason is that it can save your life. The flu is no joke. The flu can kill, and it can kill fast. It has killed millions over the years and will kill millions more. People always argue that you can still get sick even if you have had a flu shot, so what’s the point? While they’re not wrong, it’s important to know that flu shots can help decrease the severity of the flu, often cutting your down time in half. If downtime from an illness doesn’t bother you, think about the people around you. The more people that are vaccinated against the flu, the less likely it is to spread to others. The holiday season is right around the corner which means spending time with parents, brothers and sisters, grandparents, cousins, nephews, and nieces, all of whom might be of various ages and health conditions. The flu mainly attacks the “extremes of age”, like the very young, (whose immune systems have yet to fully develop) and the very old, (whose immune systems are waning). Protecting yourself means protecting the people around you. Something that people talk about is, “I’ve heard the flu has nasty side effects.” The side effects are actually very few. And if people do experience them, they are usually mild and can include a stuffy or runny nose, sore throat, and mild headache. Basically a mini-flu. The vaccination does cause a mild reaction in some people, but that’s just your immune system reacting to an invader, so when the real deal shows up, your body is ready to do battle and fight it off. It seems like a small price to pay when you look at the bigger picture. Many people don’t understand why or even know they need a new vaccination every year. The flu shot pinpoints protection. It is specifically designed each year based on the projected strains of the virus that will most likely show up. 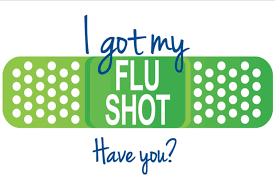 Although the percentages are not exact, the flu shot usually reduces your risk of getting the flu by 60 to 70 percent. Get this year’s version early and your body will have a better chance of fighting off what comes your way. The makers of home-cleaning products appear to be committed to making your house not only clean and sparkling, but also downright antiseptic. You really only need to disinfect occasionally and when you do, use products sparingly. In recent years, manufacturers have introduced hundreds of everyday cleaning agents labeled antibacterial or disinfectant. However some cleaners that contain ingredients like dimethyl benzyl ammonium chloride may breed antibiotic-resistant bacteria. Disinfectant cleaners that contain chlorine bleach, quaternary ammonium compounds, pine oil, or ethyl alcohol as active ingredients all work against common disease-causing viruses and bacteria. Bleach and ethyl alcohol tend to act faster than ammonia products, and bleach works particularly well on food or dye stains. Ethyl alcohol is flammable until it dissipates. When you want instant disinfecting because you need to prepare food on a surface that was just touched by raw meat or meat juices, use a disinfectant appropriate for the surface, preferably a product containing chlorine bleach. Be sure to read the product’s labeling carefully and follow any instructions about use on surfaces that touch food. Ado allow the product to “dwell” for the amount of time recommended in the directions. Or simply wash with soap and warm clean water, rinse, and sanitize using a mixture of one teaspoon of bleach per one gallon of clean water. Allow to air dry. Normal cleaning is sufficient for walls, draperies, bedding, floors, and other dry surfaces where germs do not survive long. Ordinary cleaners can suffice even for toilet bowls. Unless mold or mildew is a problem, you generally don’t need disinfectants in your bathroom at all. Cleaning thoroughly with an all-purpose cleaner or bathroom cleaner and hot water is usually sufficient. After the past 3 years our current Office Manager Cheryl is leaving us. It has been a wonderful time with her here at the Cleaning Genie. Her husband is being transfer with his job, so their family will be moving away. She will truly be missed by us, the ladies and the customers. Our new Office Manager will be Connie Wright. She has several years experience in our type of business. She is very excited to become part of the Cleaning Genie Team. She will be here to help with all your needs as Cheryl did. Please feel free to call the office and speak to her about any concerns or wishes. To clean up this house! Use a clean lint-free cloth to wipe any dirt or fingerprints from the case, keypad, and display. If needed, wet the cloth with a bit of water to clean the display. Avoid getting cell phones wet. If moisture gets under the casing, remove the battery cover and take out the battery, SIM card and memory card. Insert all the pieces into a mason jar or any container with an airtight seal that is filled to the brim with rice. Close the lid and leave it undisturbed for at least 24 hours. Afterward, reassemble the phone, turn it on, and try it out. You may have full or at least partial functionally. If the phone does not work, it will need to be professionally serviced.